sufi-mystic.net - The Key to Sufizm. Questions-Answers. Q: Why do Sufis consider sorrow and illness a gift of God? Q: Why is this world a house full of sorrows? Q: How long should I bear my suffering? I have tremendous faith in Saints and dervishes, yet I have to bear sorrow and pain. Why? Q: Why do the servants of God consider illness, too, a gift from God? Ans. : When someone is unwell, take it that there is a transformation taking place to his being, to his existence. To annihilate his self (ego) and to erase his own being (identity) is the purpose of the life of a dervish. In our creed, to weaken the ego is the first step on the path of mysticism. Illness weakens the ego but strengthens the spirit. Q: Why is it considered a tradition of the Holy Prophet to consume medicines? Ans. : Our fight is against the self and the ego, not against the body and medicine is concerned with the body. In the world of material existence, the material remedy for illness is medicine. Q: What should I do to gain nearness to God? Ans. : Become an enemy of your being (wajud). Q: I am fed up of my difficult circumstances and am contemplating suicide. Ans. : The Holy Prophet has said that there are two parts to faith – patience (sabr) and gratitude (shukr). Whoever does not have patience in trying circumstances, in such a person, there is no evidence of faith. This is the reason why the spirits of those who commit suicide do not find salvation, because such people do not have faith and faith has a direct link to salvation. Q: I am easily distracted by the material world. What should I do to cool-off my heart from worldly things? Ans. : Do not look at anything directly but with a fleeting glance. Q: I wish to leave my spiritual guide (pir) and become your disciple (murid) because he does things prohibited by the religious laws (shariat). Did Adam not make a mistake? Q: I have a family. What will happen to my family and me after I join an Order? Will I have to leave them? Ans. : You have no need to leave them. Live together as the Moon, the stars, the Sun and the other planets live in the universe. 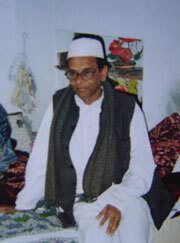 There are several divisions of a day (pehar) and the sufis lead their life in a similar manner. They live a balanced life. Q: My wife is always full of anger. What should I do so that she may start caring more for me? Q: Can I include my wife in my business? — Khwaja Moinuddin Hasan Chishti. Q: Will my family also have to join the Order? Ans. : There is no need for them to join. Every one has freedom. It is a practical path. Even a Sufi carries his own cross for death. Q: Can I as a Muslim approach a non-Muslim healer or Guru for healing or help? How can I judge whether he is a correct person or not? Ans. : It is not a matter of religion or of spirituality (ruhaaniyat) but a matter of faith. Every where there are good and bad people. Wherever there is a talk of money or there are expectations, you can take it that there is something wrong. Q: Should sufis refrain from alcohol, tobacco and other intoxicants? Ans. : Actually Chishti order is based on the love of the Holy Prophet Mohammed & the sufis believe that the intoxication of love is more powerful than that of alcohol or tobacco. Q: How can I get rid of magic or a curse ? Ya Qabiz - 21 times every morning and evening. Q: I am facing discord in my marriage. What can I do to improve my marital relationship? "And I cast down upon thee love from Me (that everyone may love thee); so that thou mightest be brought up under My eyes (as I will)"
Q: What is Muttah & how is this viewed in the Sufi path? Ans. : Muttah means temporary wife. In Sufism there is no place even for the word "temporary". Sufism is not a way to pass away time. If a step is once taken along the Sufi path, it cannot be taken back.